In early October, Broadcom Foundation and Society for Science & the Public (SSP) today announced the top winners of the fifth annual Broadcom MASTERS® national STEM (science, technology, engineering and math) competition for sixth, seventh and eighth graders. Broadcom Foundation and SSP also announced first and second place winners in each of the STEM categories, Rising Stars, and a Team Award. In addition, students elected their class speaker, the first recipient of the Scott A. McGregor Leadership Award, honoring Broadcom’s President and CEO who has championed sponsorship of the program since 2010. 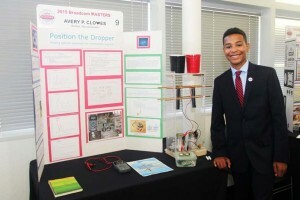 Avery P. Clowes, of Bolton, MA, won a first place Science Award for his project on an electrostatic generator. He was also the one student selected the group members to represent their class as speaker, based on leadership abilities. Congratulations, Avery on these remarkable achievements. Broadcom MASTERS winners were chosen from the 30 top finalists (14 girls and 16 boys) from 14 states representing 29 schools. Winners were selected by a panel of distinguished scientists and engineers. Thirteen-year-old Annie Ostojic, of Munster IN emerged as this year’s top winner, taking home the prestigious Samueli Foundation Prize for her mastery of STEM principles and team leadership demonstrated throughout the rigorous weeklong competition. Titled “A Novel Microwave Cavity Design Using Cylindrical Parabolic Reflectors to Optimize Energy Efficiency ,” her science fair project expanded upon knowledge she accumulated in prior competitions in order to apply science and engineering to innovating a more energy efficient microwave design. Ostojic performed complex experiments and designed prototypes to achieve the next level of creative solutions for environmentally friendly microwave cooking. The $25,000 Samueli Foundation Prize is a gift of Dr. Henry Samueli, co-founder of Broadcom Corporation, and his wife, Susan Samueli. Winner: Sebastian Mellen, 14, of San Diego, Calif.
Project: MathSuite: An Innovative Android App that Makes Dreaded Calculations FUN! Published on Google Play! Sebastian Mellen was awarded the Marconi/Samueli Award for Innovation for his vision and promise as an innovator who, in the spirit of radio inventor Guglielmo Marconi, demonstrated aptitude and skill in technical and mathematical concepts both with his science fair project and throughout team challenges. Each of these finalists (first and second place award winners) were selected for demonstrated skills and promise in each of the disciplines represented by STEM. First place winners are awarded $3,500 and second place winners receive $2,500, in each case to support the finalist’s choice of STEM summer camp experiences offered around the country. Each STEM winner also wins an iPad. First Place: Maximilian Du, Manlius, N.Y., for his project on a new method to measure and extract caffeine from drinks. Second place: Hannah O. Cevasco, San Carlos, Calif., for her research on the healing properties of honey. First place: Manasa (Hari) Bhimaraju, Cupertino, Calif., for her project on a low-cost animated teaching tool for the study of elements in the periodic table with an interface for the visually impaired. Second place: Anusha Zaman, Baton Rouge, Louisiana, for her project on the potential health effects of betel use. 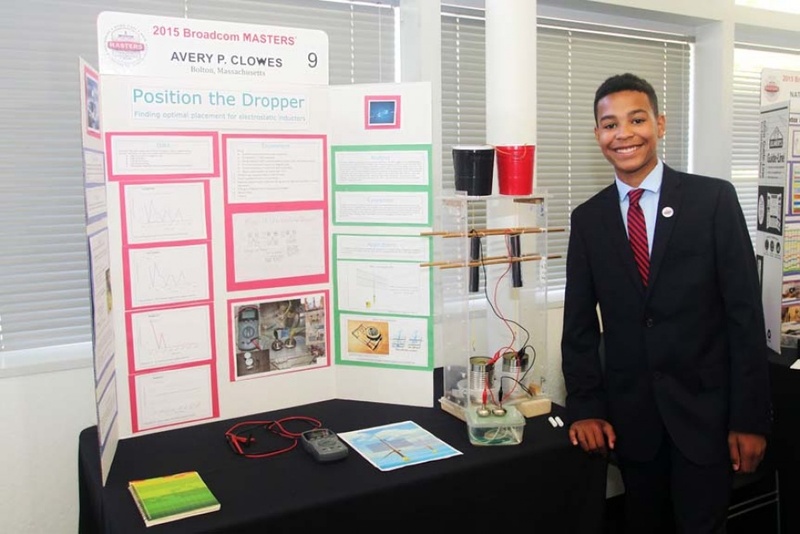 First place: Avery P. Clowes, Bolton, Mass., for his project on an electrostatic generator. Second place: Soyoun Choi, Melbourne, Florida, for her project on the effect of bilingualism on cognitive development in adolescents. First place: David Yue, Plano, Texas for his project on 3-D x-ray reconstruction processing and its application to cancer prevention. Second place: Madison A. Toonder, St. Augustine, Fla., for her project on the study on the effect of sunblock nanoparticles on oysters’ ability to filter bay water. Each of the Rising Stars wins a trip to Intel ISEF, the world’s largest international high school science fair competition, in May 2016 as the United States delegate to Broadcom MASTERS International, in recognition of their work throughout the Broadcom MASTERS finals. Evelyn Bodoni, Centennial, Colo., for her project on the prevalence and reasons for student cheating. Anish Singhani, San Ramon, Calif., for his project on an electronic system that lets a person use brain waves to control devices, such as a wheelchair and computer keyboard. Each member of the team that best demonstrates their ability to work together, and solve problems through shared decision making, communication and scientific and engineering collaboration will receive an iPod nano. Finalists select one student from the group based on their leadership abilities to represent their class as speaker. Winner: Avery P. Clowes, Bolton, Mass. The Broadcom MASTERS (Math, Applied Science, Technology, and Engineering for Rising Stars) program helps middle school students translate a personal interest into a passion for science, engineering and innovation, and encourages them to continue studying science and math through high school and college. Sponsored by Broadcom Foundation, a non-profit public benefit organization funded by Broadcom Corporation, the Broadcom MASTERS is a program of Society for Science & the Public. SSP has been the leader of the world’s most prestigious science competitions for more than seven decades.